We have finally had some of the glorious winter weather for which south-east Queensland is renowned – clear, sunny days and crisp, cool nights. The majority of yesterday and today has been spent in the garden. 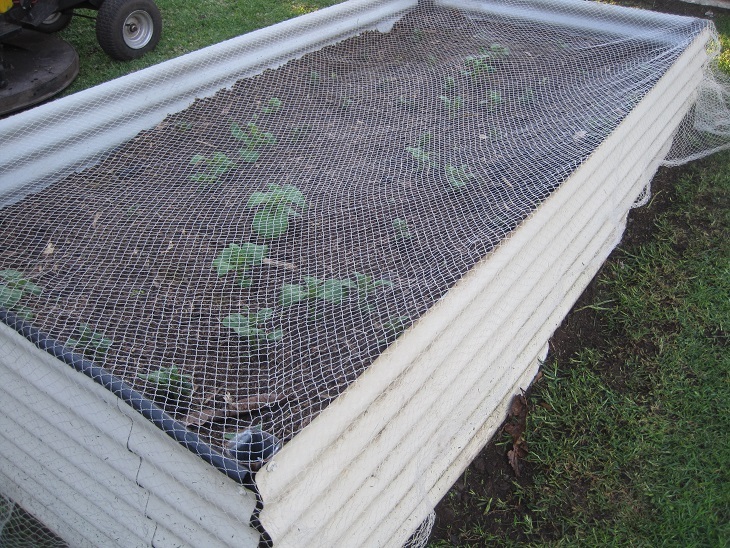 I have previously shown you the 3 raised vegetable garden beds. One was planted out with seeds a couple of weeks ago. 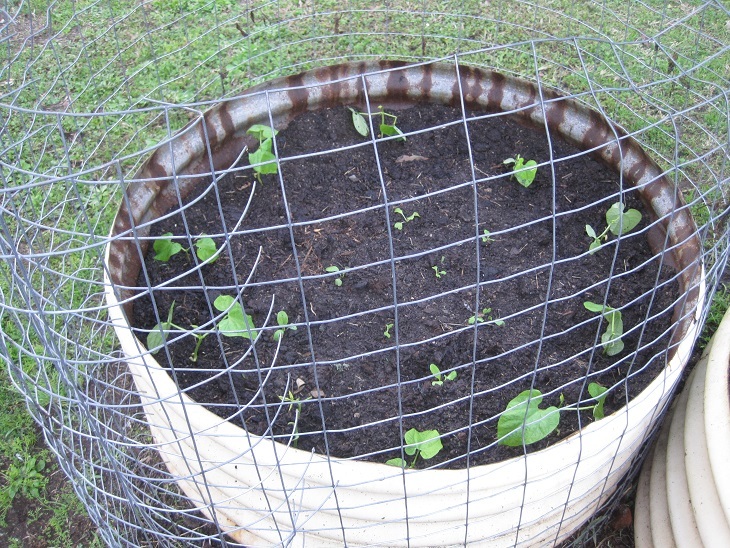 I planted 2 bean seeds together in each hole and they all germinated so I transplanted the extras. I am not sure whether they will survive the process but it never hurts to try. We moved some lemon tree prunings which had been in this tank and filled it with soil from one of the old garden beds which is now redundant. The soil is fabulous and it would be a shame to waste it. We mixed it with some mulch (from the poinciana stump which we had ground last year) and also some mushroom compost. 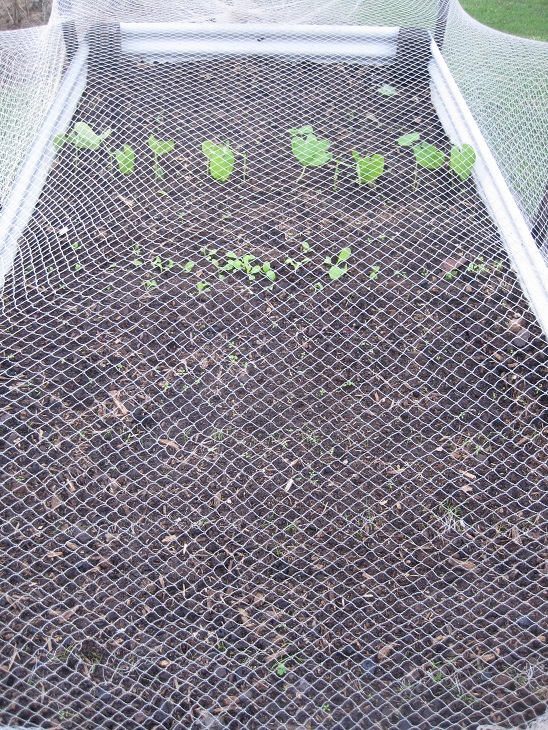 In the centre you can also see some bok choy seedlings. The bok choy seeds came up so thickly that I have thinned heaps of them and will thin them out again as they get a bit bigger. 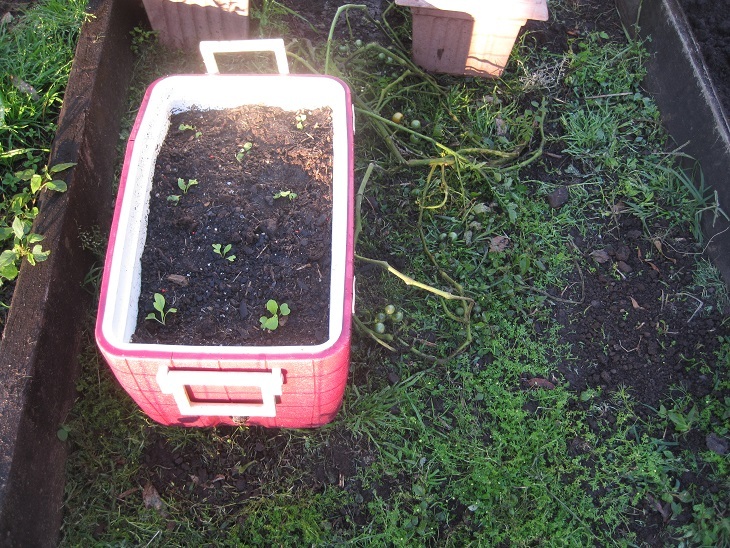 I could not bear to just throw the thinnings away so they were all transplanted. 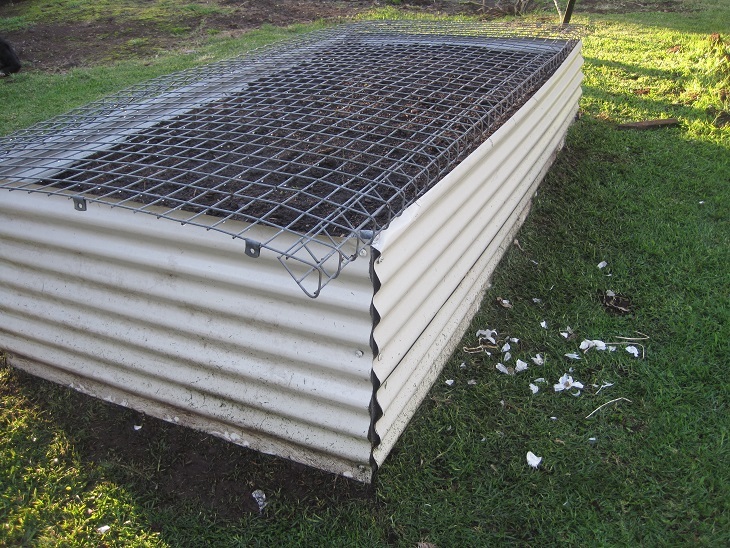 Some went into this old esky filled with soil and mulch. I put some others in between the potato plants in the other raised bed. The bok choy will be well and truly finished before the potatoes take over. The carrots, onions and beetroot have also germinated and are growing but are probably too small to identify in this photo. You can, however, see the beans and bok choy. A few weeks ago I bought some organic garlic ready to sprout and plant. It has been languishing in a bag on the floor of the pantry but today was the day to plant it out. Firstly, we had to finish preparing the third raised bed. 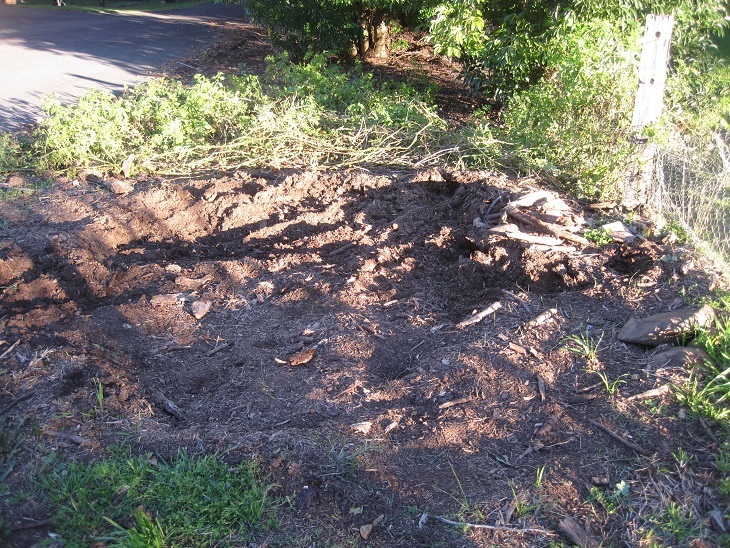 It was about 1/3 full of leaf litter, mushroom compost and shredded arrowroot leaves. 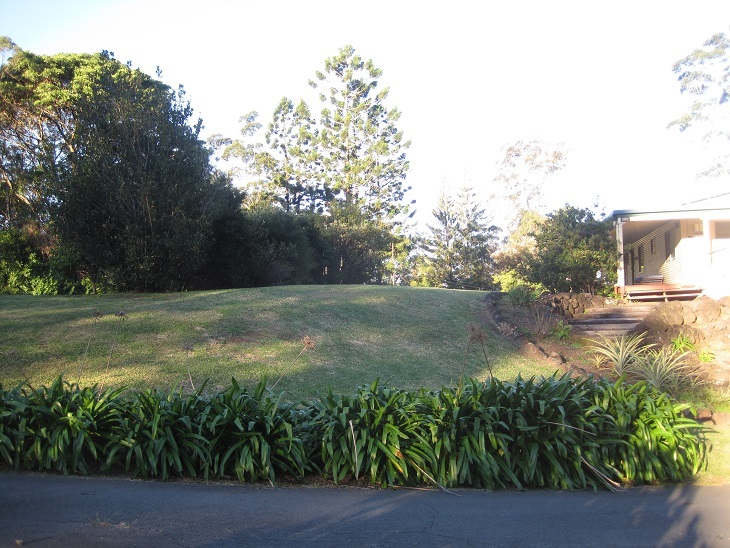 Today we added some grass clippings after The Duke had mowed the lawn area area the vegie patch, more mushroom compost, lots of mulch and soil as previously described. Then it was time to plant the garlic. We peeled off the papery outer layer, separated the cloves and planted them in rows with the sprouting tip pointing upwards. You can see all of the shredded outer layers on the ground beside the bed. It really did look like something had been massacred. The bed is 2.4m x 1.2m and it is entirely planted with rows of garlic. If this is even moderately successful I should never have to buy garlic again! 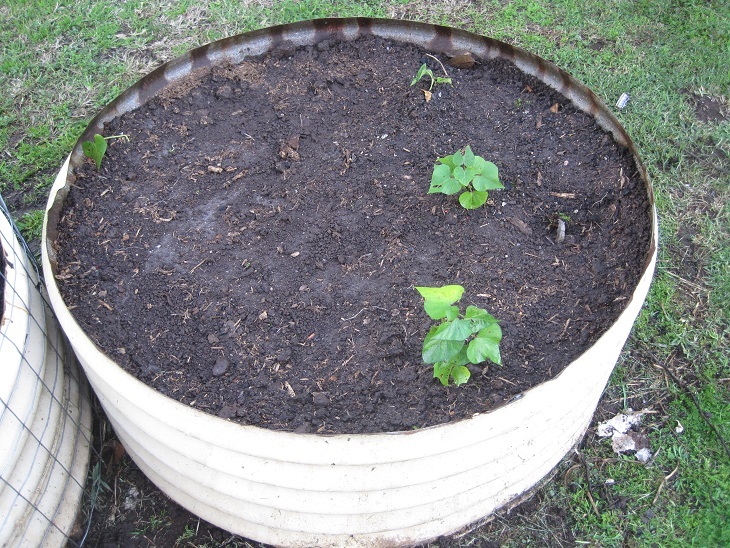 I cleared some old cherry tomato plants out of another round tank, topped up the soil and mulch and planted these golden sweet potato plants that had been in a pot for ages since my brother-in-law gave them to us. 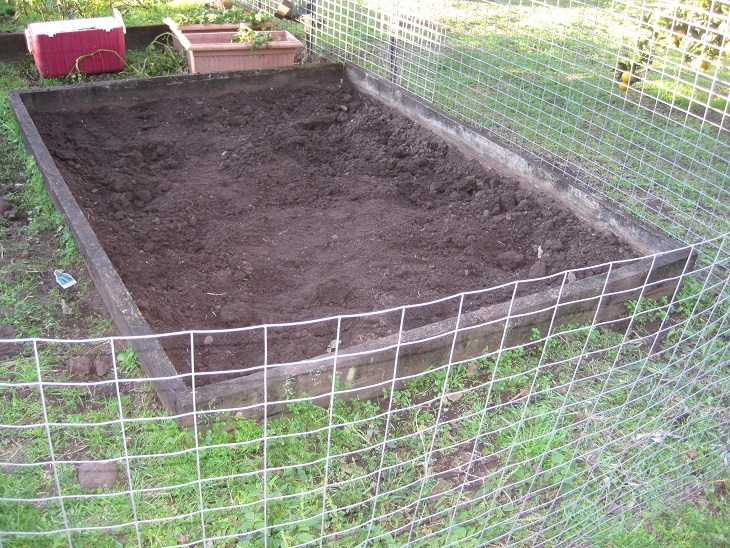 This is the old garden bed where we have been digging up the soil to re-use. There is still plenty left. The pile of mulch which resulted from the grinding of the tree stump last year has been put to good use in the garden beds. We still have more that we can take from here to build up the next round of garden beds. It is gratifying to be able to use and reuse everything from our own property in the gardens. Leaf litter, compost, mulch, soil and grass clippings all go into creating the next lot of vegetables for us to eat. Chickens, chickens manure and eggs are also part of the cycle. Trees provide fallen timber for firewood which in turn leaves ash that we put back into the compost heap or garden bed. Permaculture in action really is the circle of life. Tonight’s post is in response to a question posed by Jean in the comments of my post a couple of days ago about Zero Waste. She asked about alternatives to using plastic to line a kitchen bin. I have read about using newspaper to make an origami-style bin liner and one day I might do that. In the meantime, I find that despite my best efforts, I always seem to have plenty of plastic bags for the purpose. I line my small kitchen bin with whatever plastic bag comes to hand. I do not knowingly bring any extra plastic bags into the house but some is simply unavoidable at this stage. Any bag that looks as though it would be useful for this purpose is saved. I keep them in a ziplock bag in the laundry cupboard. For example, I buy frozen peas so I carefully slit the top of the bag and then use that in the bin. Often, it does not tuck neatly over the edge but I am prepared to accept that. I use a rubber band to tie it off before throwing in the bin. If I get any plastic bags in packaging of items such as small appliances these are kept for the bin as well. They usually have a few air holes to avoid accidental suffocation but that is not a problem as my waste is usually just confined a small number of non-recyclable items which need to be contained rather than necessarily sealed in plastic. I do not put any meat scraps in my kitchen bin. I generally buy meat that has no waste eg: skinless, boneless chicken breast fillets, premium mince etc. The exception is bacon as I trim the fat off it. I put the meat scraps in a bag in the freezer and occasionally add them to a kitchen rubbish bag immediately prior to putting the garbage out for collection. Anything which can be composted is collected in the compost bucket – this includes all fruit and vegetable scraps as well as eggshells and butter wrappers. Finally, here are the bins in a pull-out drawer in my kitchen. Each bucket lifts out for easy disposal and cleaning. On the left is the small one I line with my rubbish bag and on the right is the recycling. I will do another post soon and examine exactly what rubbish we have for a week. Let me know how you manage your various waste streams. Have you made a conscious effort to reduce the amount of rubbish you send to landfill? 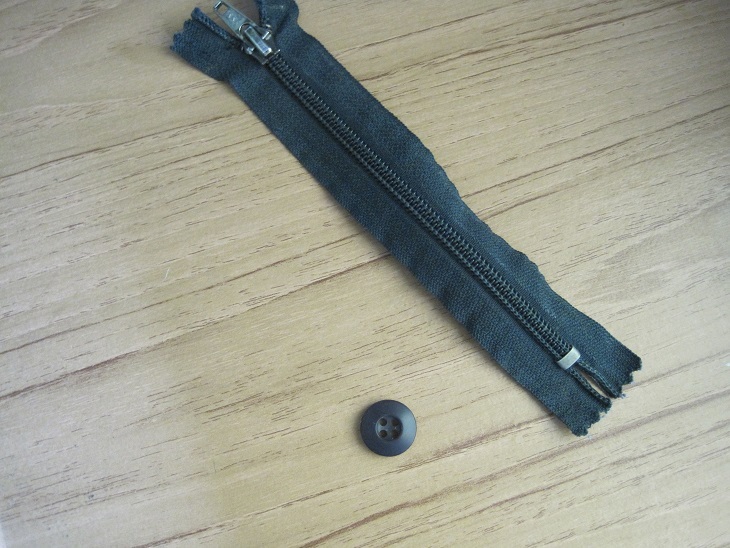 Despite all the mending and repairs, there comes a time when things reach the end of their life. This pair of The Duke’s trousers is a perfect example. I have previously posted about patching them and while the patches have survived there is yet another worn patch lower down the leg. 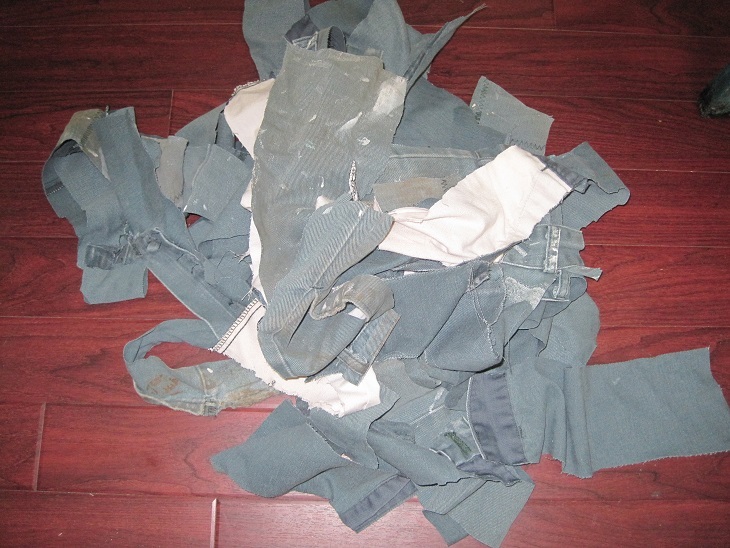 These are not accidental rips – the fabric is simply wearing out and they are getting quite thin in numerous places. Therefore, it has ceased to be worthwhile mending them any longer. My initial thought was to throw them in the bin but then I realised that as well as being mindful when we are purchasing items we should also be responsible for them at the end of their useful life. Many garments are cut up for rags or tying up plants in the garden but these are suitable for neither. 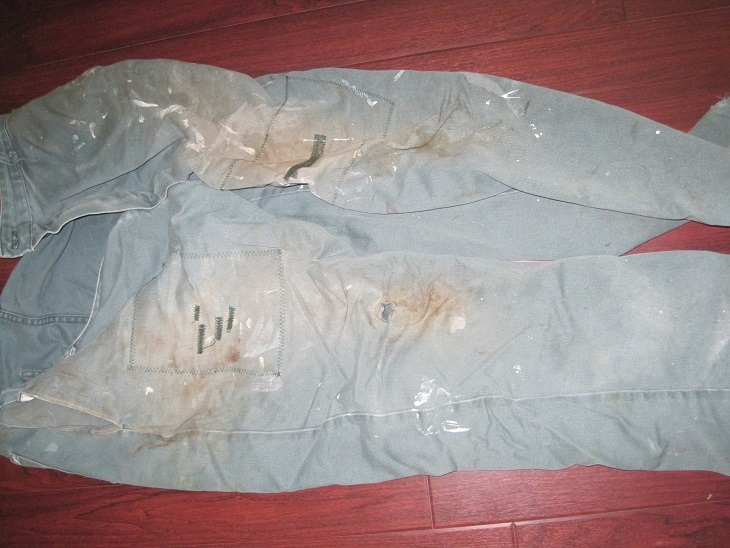 I decided to remove the zip and button for possible future re-use and decided that since these trousers are cotton they could go in the compost. So that the fabric would mix with the rest of the compost I cut the trousers into strips and here it is ready to become part of the garden. 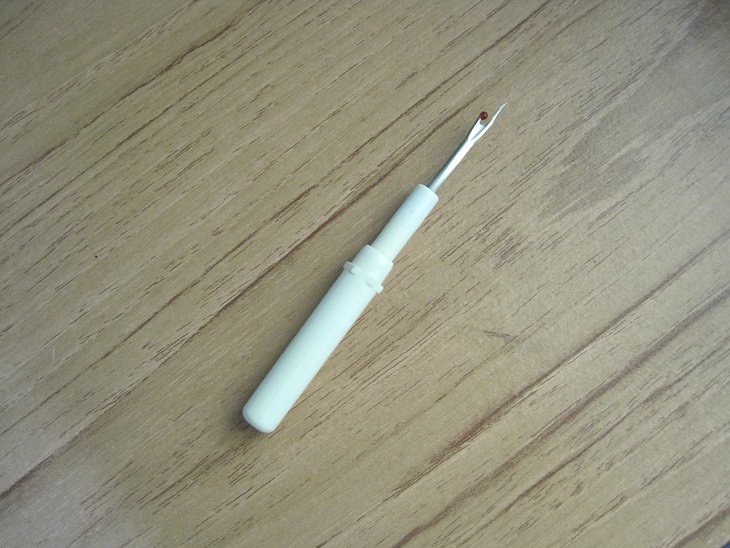 This is my seam ripper which is identical to the one that I broke while removing the zip from the trousers. I am not sure why I had two of these but now there is only one. The broken one went in the rubbish bin. After a couple of days spent debating the carbon tax it is time to get back to the things I do every day which reduce our carbon footprint today and increase our self-reliance so that we can face whatever the future may bring. Today was my day off so I immersed myself in all these jobs and more. It has been productive and worthwhile.